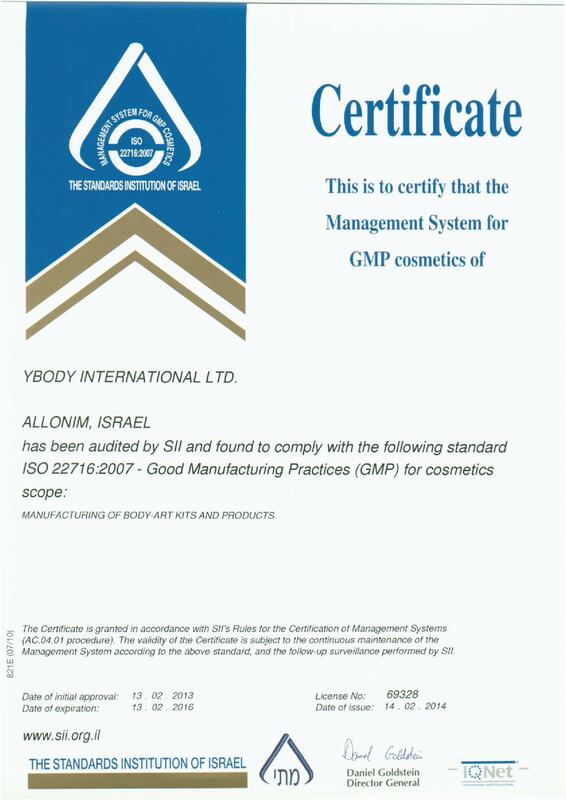 Ybody International Ltd. works with the highest standard of consumer products and is stringent to the European standards for cosmetics ISO-22716 (GMP – Cosmetics Good Manufacturing Practices). Ybody’s factory is tested once a year by an external team to ensure the factory environment and that the company regulations and working methods meets the guidelines required for manufacturing and selling of active pharmaceutical and drug products. All components of the company products are tested and meet the highest standards of consumer products. Ybody offers an exclusive high quality “Pink Body Glue”which is listed with the US Food and Drug Administration (FDA Registered). This Glue is proven to be very effective for body decoration and especially glitter tattoos. We found that this is the most effective and healthiest glue product with no customer complaints since the beginning of its use. Ybody products have been sold since 2003 – and after more than ten years of experience, Ybody can ensures its customers of the highest level of product safety. Just check out our product certifications.